The astronomical unit once relied on a mathematical equation to provide its value for the distance from the Earth to the Sun. "The broader community of astronomers are able now to better, with less efforts, understand what their colleagues — astronomers who are experts in planetary ephemerides — do and how they produce the high-accuracy theories of motion in the solar system," he told SPACE.com by email. The revision also makes the unit easier for engineers, software designers and students to understand, Klioner and his colleague Nicole Capitaine, of Paris Observatory, noted. At the same time, the redefinition can serves an epitaph to the bygone era when Earth-bound scientists depended on viewing angles to calculate celestial distances. Lacking precise instrumentation, early astronomers relied heavily on angles to calculate the size of the universe. By studying Mars from two separate points on Earth, 17th-century Italian astronomer Giovanni Cassini was able to use trigonometry to calculate the distance from Earth to the sun with only about a 6 percent error. "Expressing distances in the astronomical unit allowed astronomers to overcome the difficulty of measuring distances in some physical unit," Capitaine told SPACE.com by email. "Such a practice was useful for many years, because astronomers were not able to make distance measurements in the solar system as precisely as they could measure angles." Modern instruments can come within a few meters of exactly determining distances of nearly150 billion meters (150 million kilometers), or some 93 million miles. The astronomical unit eventually came to be defined by a mathematical expression that involved the mass of the sun, the length of a day, and a fixed number known as the Gaussian gravitational constant. Because the Earth orbits its star in an ellipse rather than a circle, the length of a day shifts over the course of a year. 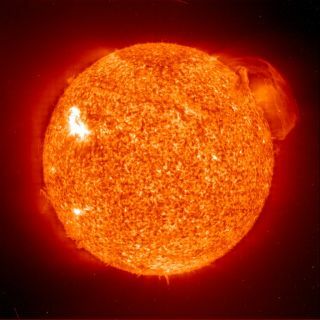 At the same time, the sun is constantly transforming mass into energy. In the 20th century, famed scientist Albert Einstein added general relativity to the mix. According to the famous theory, space-time is relative depending on one's frame of reference. The new fixed number is the best estimate of the original expression, Klioner said. "If we would decide to continue with the old definition, we would have to add several additional conventions to make the latter meaningful in the framework of general relativity," he explained. "A better way was to change the definition completely — and this is what we succeeded in doing." Capitaine said, "The change of definition of the astronomical unit mainly concerns those in the field of high-accuracy solar system dynamics." Satellites and other crafts traveling in space are not affected, because they rely on set distances. "The distance between the Earth and the sun, as any physical distance, should be measured and cannot be fixed by any sort of resolution," Klioner said. Capitaine and Klioner are among several scientists who worked over the last two decades on a revision of the astronomical unit. Capitaine said she first got involved when she gave a presentation in 1994 with Bernard Guinot, also of Paris Observatory. Over the course of 10 years, several published papers by various scientists discussed the ramifications of changing the stalwart unit. The three scientists presented the issue to the astronomical community on a number of different occasions. Other astronomers helped to demonstrate the feasibility of the change before it landed on the table of one of the working groups for the International Astronomical Union. The resolution was reworked several times before it won unanimous passage. "The change as we have it now is really a product of collective work," Klioner said. He went on to add, "I think that the energy, commitment, and the worldwide scientific reputation of Nicole Capitaine were crucial for getting this change through." Shifting from a constantly changing value to a fixed number may seem like an easy choice, but the group faced some resistance. Some believed that the overhaul would be too difficult to implement with crucial software, while others were concerned that discrepancies might be introduced into past work. Still others were uncomfortable changing such a historic definition. Eventually, all concerns were apparently met. "Within the last two years, I have not heard a single objection for the change itself," Klioner said. Editor's note: This story has been corrected to fix a units error in the tenth paragraph that incorrectly stated the Earth-sun distance was nearly 150 million meters. It is nearly 150 billion meters.